A safe is a tool, and like any tool, there are proper and improper ways to use it. Check out these ten helpful tips or best practices for safes. 1. Buy The Right Safe for the Job. A safe’s primary function is to protect an object or objects from an unwanted outcome or outcomes. When buying a safe, select one designed to prevent the scenarios applicable to what you’re protecting. For example,a safe designed to protect large amounts of cash or jewelry from burglary is going to be very different both in features and cost than one designed to protect your important documents from a fire. Not all safes are rated against a burglary attempt and not all safes are rated against a fire. Seek the advice of a professional to ensure you’re making the right choice. 2. Buy A Larger Safe Than You Anticipate Needing. 3. Put Your Safe In A “Safe” Place. Location, location, location. While this expression is more commonly used to describe real estate, it is also true for placement of your safe. Put your safe in a place that is hidden and out of view. Many people associate a safe with valuables, so even if you don’t have anything of value in your safe you may become a target of a break-in if someone knows you have one. The fewer people who know about your safe, the safer it is. Some higher end safes are available with fancy designs and finishes. Resist the urge to show it off to your friends and family. Also, try to locate the safe as low in a building as possible. 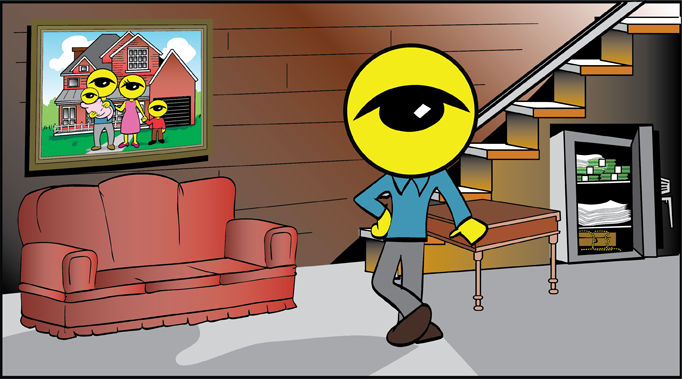 During a fire, a safe located on a higher floor may fall through a weakened structure into the basement. While professional safes are designed to anticipate that possibility, the probability that your belongings stay safe throughout a fire increases as you decrease the disturbance a safe will endure during the fire itself. 4. Bolt Your Safe Down. Make sure that wherever you’ve located your safe, it is bolted in place. People often associate a safe with being a heavy object and don’t think their safe could be easily removed. However, someone who knows what they’re doing can move a safe very easily with simple tools such as a hand truck. A good rule to follow is that any safe should be bolted to the floor, but if your safe weighs less than 1,000 lbs., it should be mandatory that you bolt it down. Water can impact your safe in two ways. The first is from daily exposure to moisture that is naturally in the air. Protected items can be affected by this moist air so using a safe dehumidifier is important. Dehumidifiers, such as this one here, come with different options including reusable versus disposable or active versus passive. Keeping the humidity in your safe to a minimum can help prevent unwanted odors, mold, or rust. Water can also impact your safe during a fire. Fire fighters will be spraying water at a high rate to combat the flames and while some safes utilize gaskets to help minimize this impact, it is possible water will get in your safe. Anything that will be affected by water, such as paper documents, should be inside heavy duty plastic containers (such as those made by Tupperware). While the heat of the fire may cause the containers to distort, they will usually protect the documents from water. 6. Use A Secure Combination For The Lock On Your Safe. Choosing a secure safe combination is a lot like choosing a secure password on your computer. You do not want to choose something that people who know you can easily guess. The random one generated by the manufacturer of your safe is often a good choice because it is not tied to any of your personal information. Some safe manufacturers can also help you retrieve your lost combination if it’s still set to the one the factory gave you. Another common mistake safe owners make is putting the combination to their safe INSIDE the safe. When they forget their combination, it is trapped and the safe may need to be drilled open to get inside. 7. Fully Relock Your Safe When You’re Done Accessing It. Relocking your safe properly is important to ensure it can do its job. If you have a mechanical dial, make sure you spin the dial a full 360 degrees at least 4 times to make sure the lock is fully reset. Also, double check that your safe door is locked before you walk away from it. Safe users typically go inside their safe for a specific reason. When focused on that reason, a user can sometimes forget to relock their safe. 8. Replace Your Lock Batteries Annually. Safes that utilize an electronic lock should have their batteries replaced on an annual basis to ensure your safe can open when you need it to. The number one cause of safe service call requests is issues that arise from dead, or almost dead, batteries in safe locks. We recommend using brand new Duracell brand batteries. They tend to last the longest and produce a more consistent voltage than other brands. 9. Know Your Replacement Warranty Before You Need It. Many professional safe brands will offer a free replacement safe if you’re the victim of a fire or a burglary attempt. Certain brands have different requirements to qualify for this replacement, so contact your manufacturer regarding your warranty before you need it to ensure you have everything you would need to make a claim should one become necessary. Keeping your receipt, date of purchase, serial and model numbers in an accessible place is a good starting point. 10. Utilize A Reputable Service Company. Safes will occasionally need service over their lifetime. Make sure you utilize a reputable service provider in your area, like Northeast Security Solutions. We have certified service technicians and are factory authorized to order replacement parts for the common professional safe manufacturers such as AMSEC, Gardall, and FireKing. Cutting corners on service can lead to performance issues down the road. In conclusion, utilizing these 10 best practices for safes will help ensure you get the performance you expect out of your safe. Feel free to contact us for any other help you need for your safe or vault.